The Agarwal and Goenka families - promoters in Emami Ltd - have sold 10 per cent of their stakes for Rs. 1,600 crore to pare the debts of other Group companies like Emami Cement, Emami Power and others. The sale effectively brings down the promoters’ holding in Emami Ltd from 72.74 per cent to 62.74 per cent. The sale was executed in the stock exchanges on Monday and the stakes were sold to SBI Mutual Fund, Premji Invest, Amundi, IDFC, L&T Mutual Fund and others. 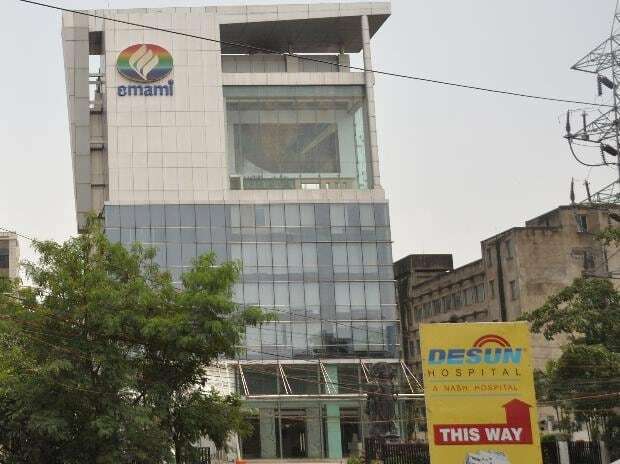 It is expected that paring debts of the Group will help reduce the pledged shares of the promoters in Emami Ltd with financial institutions. Earlier, out of their total shareholding, the promoters in Emami Ltd had pledged 47.6 per cent of their stakes to raise capital to fund capital intensive projects like its cement, power and healthcare businesses. Although Emami Ltd’s debt as on March 31, 2018 was around Rs 118 crore, the Agarwal and Goenka families, had to pledge part of their shares with creditors to finance the Group’s other businesses. However, last week, the Agarwal and Goenka families had raised their pledged shares in Emami Paper Mills, another listed entity of the Group, from 44.98 per cent to 49.93 per cent. “We have concluded a stake sale which will ease the liquidity position of the promoter group and reduce the debt. We are committed to maintaining our significant majority stake in the company and do not anticipate any further dilution of stake in the foreseeable future”, Mohan Goenka, director at Emami Ltd said. After the announcement of their third-quarter results, Goenka in an investor conference call had stated that the company is looking at reducing the percentage of the pledged shares in the Group’s flagship company, Emami Ltd to around 30-35 per cent. With the pledged shares percentage nearing 50 per cent of the promoters’ total holding, sector analysts like Abneesh Roy of Edelweiss Securties had flagged concerns over the company. “Although the deal has been done at a low price, we believe this will reduce promoters’ debt level concerns. Deal with leading private equity (PE) player is being parallelly worked upon”, Roy said. Sources suggested that talks with PE player may not involve a direct stake sale but borrowings at a lower interest. 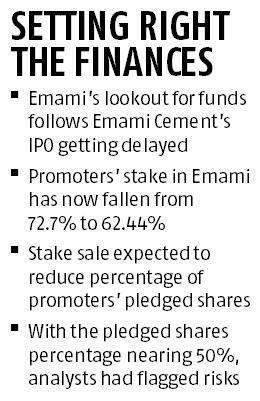 Emami Group’s lookout for funds to lower its pledged shares follows Emami Cement’s initial public offering (IPO) getting delayed. The plan was to raise a total amount of Rs. 1000 crore – Rs 500 crore would consist of fresh issuance of shares and another Rs 500 crore would be offered for sale by Emami Cement promoters. In its Draft Red Herring Prospectus, Emami Cement said that the fund so raised would be used to reduce this company’s indebtedness which, according to a Crisil report stands at Rs 2,179.50 crore as well as some of the proceeds will be routed for general purposes. A source suggested that owing to the prevalent market conditions, Emami Cement decided not to pursue this IPO in the near future which prompted the Group to look for funds from elsewhere. Ratings agency Crisil had given Emami Cement a long term rating of BBB positive in September last year with a declaration that the issuer is not cooperating. It alleged that although it followed up with Emami Cement for obtaining information through letters, emails and over the phone, Emami Cement had been non-cooperative. However, after Emami Cement’s appeal, Crisil withdrew its ratings on Rs 1,979.50 crore out of total Rs 2,179.50 crore of bank facilities. Out of the total outstanding debt of Emami Cement, long-term debt accounts for Rs 1,890 crore. In case of Emami Power, an India Ratings report in May last year suggested its indebtedness to be Rs. 143 crore with this company serving a bank guarantee of Rs. 25 crore. With an aim to have more than 300 Mega Watt peak (MWp), Emami Group had set up 11 MWp solar power projects in Karnataka, a 10 MWp such project in Gujarat, another 3.3 MWp solar power project in Tamil Nadu and 22.5 MWp project in Uttarakhand thereby incurring substantial investment. For its Karnataka project, the Group had taken a debt of Rs. 53 crore while for the Uttarakhand project, Rs. 90 crore debt was taken. “Debt service reserves amounting to Rs. 75 lakh, equivalent to one-quarter of interest service for the Karnataka project, and Rs. 3.4 crore, equivalent to one quarter’s debt service for the Uttarakhand project, have been created. The bank guarantee of Rs. 25 crore shall be utilised towards bid bond guarantee, security for performance, earnest money deposit etc. for developing solar projects. Any additional borrowings by the company will attract a rating review”, India Ratings had stated in its report. However, over the years, profitability from this segment has been flattish at around Rs. 2.5 crore.